President Barack Obama holds a 3-to-1 lead over Mitt Romney among Latino registered voters. According to the new Pew Hispanic survey, 69% of Latino registered voters say they would vote for Obama if the election were held today, while 21% say they would support Romney. This is similar to the margin among Latinos in the 2008 presidential election, when Obama won two-thirds (67%) of the Latino vote to Republican John McCain’s 31% (Lopez, 2008). The new survey also finds that a rising share of Latino voters say that the Democratic Party has more concern for Latinos than does the Republican Party. Today 61% of Latino registered voters say this, up from 45% in 2011. This is the highest level recorded in Pew Hispanic surveys since 2002. By contrast, just 10% of Hispanic registered voters say the Republican Party has more concern for Hispanics than the Democratic Party, down slightly from 2011 when 12% said the same. Among Latino registered voters who identify with or lean toward the Democratic Party, 92% say they will vote for Obama and 4% say they will vote for Romney. Among those who identify with or lean toward the Republican Party, 78% say they will vote for Romney and 15% say they will vote for Obama. Only 9% of Latino registered voters do not identify with or lean toward either the Democratic Party or the Republican Party. Among them, 24% say they will vote for Obama while 16% say they will vote for Romney and the remainder say they will vote for another candidate or don’t know. In addition, Obama holds a wider advantage over Romney among Hispanic registered voters who say they are satisfied with the direction of the country than those who say they are dissatisfied with the direction of the country. Among those who are satisfied with the direction of the country, Obama leads Romney 80% to 13%. By contrast, among those who are not satisfied with the direction of the country, Obama still leads Romney, but by a smaller margin—58% versus 30%. Among Latino registered voters who are Spanish dominant, Obama’s lead over Romney is 59 percentage points. Among those who are bilingual, Obama still leads over Romney, but by a smaller margin of 50 percentage points. And among English-dominant Hispanic registered voters, Obama is favored by a majority, but by a smaller margin of 40 percentage points. Among Latino registered voters who say they are absolutely certain to vote, Obama’s lead over Romney is wider (72% versus 22%) than it is among those say they are not absolutely certain if they will vote (66% versus 20%). Recently the Obama administration issued an order that allows some unauthorized young immigrants to stay in the country and apply for temporary work permits. Among Latino registered voters who know someone who has applied for the program, support for Obama is stronger (74%) than it is among those who do not know anyone who has applied (67%). Partisan allegiance to the Democratic Party among Hispanic registered voters is at its highest level since at least 1999. According to the Pew Hispanic survey, seven-in-ten (70%) Hispanic registered voters say they identify with or lean toward the Democratic Party while 22% say the same about the Republican Party. 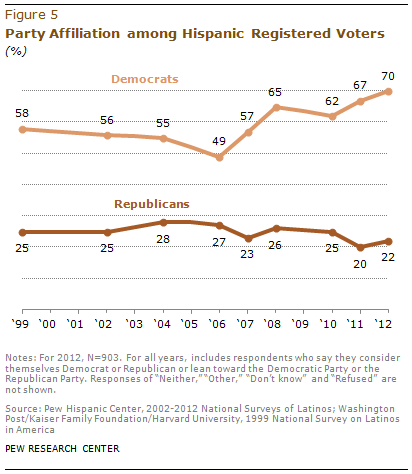 Across demographic groups of Latino registered voters, identification with the Democratic Party is strong. For more details, see Appendix A. Much has been made of the growing size of the Latino electorate. This election cycle, nearly 24 million Hispanics are eligible to vote, a record number (Lopez, Motel and Patten, 2012). And given this year’s battleground map, Hispanics may play a role in several key states, including Colorado, Florida, Nevada, North Carolina and Virginia. How do Latinos themselves see their role in this year’s election? The Pew Hispanic survey asked Latinos whether the Latino vote will have a “major impact,” “minor impact” or “no impact at all” in determining who wins the 2012 presidential election. Overall, the assessment is positive. Among all Hispanics, two-thirds (67%) say the Latino vote will have a major impact this year and 23% say it will have a minor impact. Among Hispanic registered voters, 67% say the Hispanic vote will have a major impact this year while 24% say it will have a minor impact and 8% say it will have no impact at all or say they don’t know. The view that the Hispanic vote will have a major impact on the outcome of this year’s presidential election is especially high among immigrant Hispanics. Among them, 72% say the Hispanic vote will have a major impact in this year’s election. 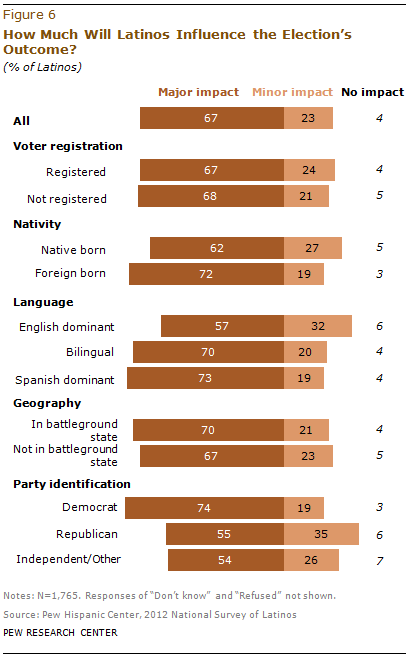 By contrast, fewer—though still a majority—of the native born say the same, 62%. Some 73% of Spanish-dominant and 70% of bilingual Latinos say the Latino vote will have a major impact this year. Among English-dominant Latinos, 57% say the same. Democrats are more likely than Republicans to say the Latino vote will have a major impact on the election. Three-fourths (74%) of Democrats say this, compared with 55% of Republicans. Those who have thought about the election “quite a lot” are more likely than those who have not given the election as much thought to say the Latino vote will have a major impact—76% versus 60%.